Diabetes By The Numbers: Mindy Bartleson. Mindy Bartleson is accomplished. I don’t think that’s overstating it. What’s really amazing is how accomplished she is at only 24 years of age. Mindy lives with a number of chronic conditions, diabetes being one of them, and we talk about them here. Many people remember her from her previous work at College Diabetes Network. She has a really super blog. Her writing has been featured on numerous websites. And now, she’s written a book. We talk about the book, about what it’s like to live with so many things and go to college and write a blog and write a book too. This interview is being aired in conjunction with the kickstarter campaign designed to help Mindy get her book published. CLICK HERE to contribute… the end result will be well worth it. Here’s a pretty revealing look at one of nicest people you’ll ever get to know. Wow. Two things I don’t like to hear in one sentence. But… if you live with diabetes long enough, you’re going to hear questions like that. I actually had a great conversation with the person who asked that a couple of weeks ago. Once I explained about how “brittle” is not actually a medical term, we got down to the science of diabetes and what it’s really like to live with this condition every day for the rest of my life. They shared that their spouse is living with diabetes, and the three of us spoke for a while. We talked about what hypoglycemia feels like, and how our spouses reacted. They were concerned that low blood sugar meant failure. I explained that the better you manage your diabetes, the closer you are to hypoglycemia all the time. I think it was an A-Ha moment. I don’t know why, but whenever I use that second sentence in response to that question, it seems to put people at ease. Once I rolled that out, I was able to downshift into why I wear a pump (it’s my choice for my diabetes), and my CGM (I didn’t like it at first, but I’m getting used to it). 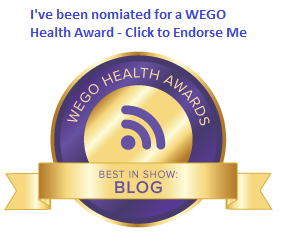 I was able to talk about interacting with others online, and how that eventually led to things like a blog and a podcast, and diabetes conferences and FDA workshops and clinical trials, and the importance of all of those. This is a question I get when there’s a low that happens more than once, at the same time of day, in front of the same person. It’s a well-meaning question… someone sees something that concerns them, and they want to help me avoid repeating the scenario. The problem is, there could be a hundred answers to that question. Either I’ve gone low because diabetes just doesn’t react the same way every day, or because I’m trying something new with diet or exercise and I haven’t figured out the perfect routine yet. Or, this just isn’t my diabetes week… it happens. Or, maybe I just made a mistake and I feel bad enough already and I don’t want to admit it. There are a number of conversations that happen due to my diabetes. Sometimes short, sometimes detailed, sometimes tinged with self-assurance or regret. I don’t know about you… but what I know about myself is that I need to keep engaging in these conversations. It’s not always about feeling great. It is always about enlightenment and being more comfortable being myself, and being myself with my diabetes. How many of you remember this post from a few weeks ago? I have received multiple responses to this, and I am happy to announce that we have a winner. Because a second, generous donor (who wishes to remain anonymous) stepped forward, we were able, together, to provide registration for the Diabetes UnConference and two nights’ stay at the Embassy Suites Alexandria, the host hotel for this gathering. Like I said in the original post, I realize this doesn’t make everything suddenly more equal and inclusive at diabetes events throughout America. Especially in light of the terrorism that took place in one of my favorite places in the world, Charlottesville, Virginia last weekend, this seems like a rather meek gesture. Sometimes we can’t change the whole world… but we can influence our little part of it. I am thrilled about sending our winner on this trip, and they are excited about attending. I’m not sharing the identity of the winner. I thought about it. But I felt that whether I did or I didn’t reveal, I could be open to criticism. By not revealing, someone could say that I’m trying to make it about me, or hide the fact that I did this. That’s a ridiculous argument, but someone could say that. If I did tell everyone who it is, I risk looking like I’m showing them off for my own benefit, which, frankly, is not what this scholarship offer or the Diabetes UnConference is about in any way. So our scholarship winner is free to share that they are the scholarship winner, should they want to. But again, in the spirit of inclusion, I want them first and foremost to be thought of as a welcomed attendee… as a valued member of our tribe… as a respected contributor to our community… as a person. For now, there is still time to register for the Diabetes UnConference Alexandria (co-located with Diabetes Sisters’ Weekend for Women conference), happening October 13-15. Room reservations are filling up fast, so if you want in, your time is limited. I can truly say that it has often been imitated, but never duplicated. It is that special and unique. Come to our gathering and share. Experience. Explore. Not about diabetes life, but about life with diabetes. No structure. No judgement. Find your tribe. Love them hard. Disclosure: I will be part of the team of facilitators at the Diabetes UnConference Alexandria October 13-15, 2017. All opinions are my own. 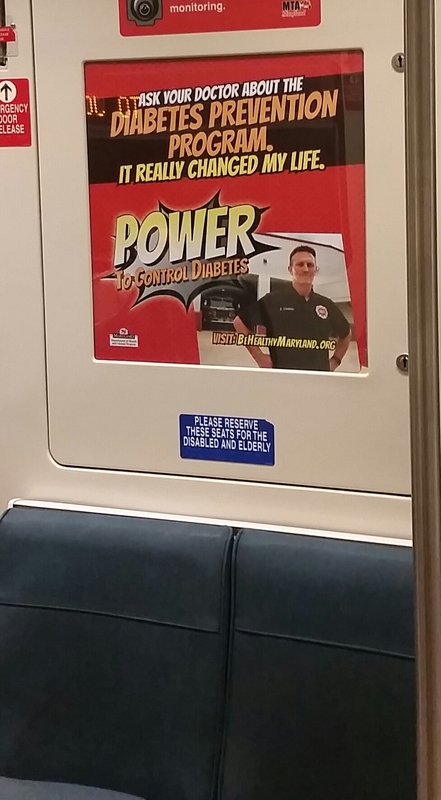 I found out that this poster is part of a diabetes prevention and awareness campaign undertaken by the Maryland Department of Health. They’ve developed a nice website, with videos and reference links, that show people the importance of identifying diabetes and prediabetes as quickly as possible. This mirrors an effort by the Centers for Disease Control and Prevention, which has its own website devoted to identifying those at risk of Type 2 Diabetes, and giving them the knowledge and resources to help them deter diagnosis for as long as possible. Why are we seeing efforts like these at the state and national level? In my state, over 1.5 million people are said to be living with prediabetes, and only a little more than 10 percent of them know they are at risk. Multiply that by 50, plus the District of Columbia, plus U.S. territories and outlying islands. That’s a lot of people, folks. Honestly, I don’t know much about prediabetes. And I really feel that if you’re going to get a diabetes diagnosis, you’re going to get the diagnosis. But why not hold it off as long as possible? I think that’s what these programs are really trying to accomplish. And just in case you’re wondering: You are worth every effort it takes to feel better and be healthier. Why not take advantage of the many tools at your disposal? Endo Visit, part 1000 (or so). Tuesday marked another quarterly visit with my super endocrinologist. Despite the fact that this was the thousandth (or so) visit with her, we still had plenty to talk about. After going over my A1c result (still excellent, but a little low), the biggest topic of conversation was analysis of my CGM data. This is the first appointment that included a measurable amount of CGM data to look at, and that made this appointment different than most. She’s concerned more about overnight lows than the lows I’ve had just before dinner. So we dialed back the basal on my insulin pump between midnight and 8:00 a.m. We’ll see if that does the trick. If I really want to be honest with myself, the truth is that I’ve been a little aggressive correcting post-meal high blood sugars. So I’m getting to 80 to 100 mg/dL before bed, and going to sleep for six or seven hours while my BGs get lower and lower. I was also honest about all that with my endocrinologist. At some point in my life, I decided that I needed to get over my feelings of what someone might say about me when I let my guard down and admitted where I might have come up short. Now, this is where you might say, “great, everything’s perfect”. But you know what? 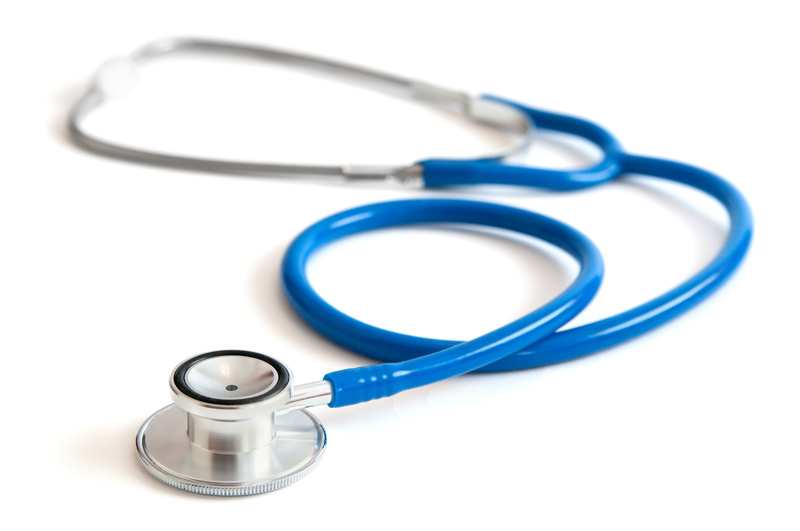 What I really needed was to work with a doctor who would listen to what I was saying and work on a strategy to solve those shortcomings, without interjecting guilt into the conversation. I mean, it’s one thing to let my guard down and speak the truth. But it doesn’t mean much if it doesn’t result in a plan of action put together in conjunction with my medical team. It’s easy to take that for granted after several years with the same endo. What we really have to remember is to find a healthcare professional (or team of professionals) who will help us find the success we seek with our diabetes. When we do find that healthcare professional (or team of professionals), we have to remain grateful and let the process of working on a better life with diabetes take its course, wherever it might lead. Both of those things can be difficult, but they are both worth the effort it takes to get there. Other than that, I got a couple of prescriptions for things that are new (like Accu-Chek Guide strips) and things that need to be replaced (like expired backup insulin pens). We talked about the #BeyondA1c workshop a couple of weeks ago, and the upcoming Friends for Life Falls Church, Diabetes UnConference, and Diabetes Sisters Weekend for Women gatherings. We only get so much time with our endos and diabetes educators. Precious time. If you can, it’s worth it to spend the time pursuing the best results possible, together.